Luxembourg does not regularly publish reports on the state of the environment. One main report was published in 1993 and there have been only two subsequent publications containing environmental indicators, one in 1998 and one in 2003 . This unenviable position led to the decision to produce a new indicator-based report on the state of the environment foreseen to be published in the course of 2015. This report will have a strong communication focus towards the general public and will be web-based only so that updates might regularly take place when new data are available. The Second National Sustainable Development Plan (NSDP2), finalised at the end of 2010 comprises a list of "unsustainable trends" which are still valid as of today. With regard to the environment, these trends are touching upon two main topics: overuse of certain natural resources, including soil and land use on the one hand, and air, on the other. To that, water quality is another problematic issue that ought to be dealt with more stringent policies. The economic development of Luxembourg these last 30 years has led to an important growth of both the resident population (40% increase over the last 20 years) and the cross-border commuters representing now almost 45% of the paid workers (a 250% increase over the last 20 years). This, in turn, has led to increasing built-up areas (housing, offices, services, infrastructures) and to ever growing transport flows, mainly by road. Population growth, coupled with the economic development in the tertiary sector, is a key driver of urban sprawling and land fragmentation. Various actions are undertaken by the authorities to limit urban sprawl. However, the demographic pressure is leading to very high prices for construction (houses, apartments, land) that, in turn, generate social problems such as access to accommodation and the ability to pay. Consequently, there is also a wish for more building land in order to reduce prices. All these developments have had, and still have, negative impacts on biodiversity and on water quality. 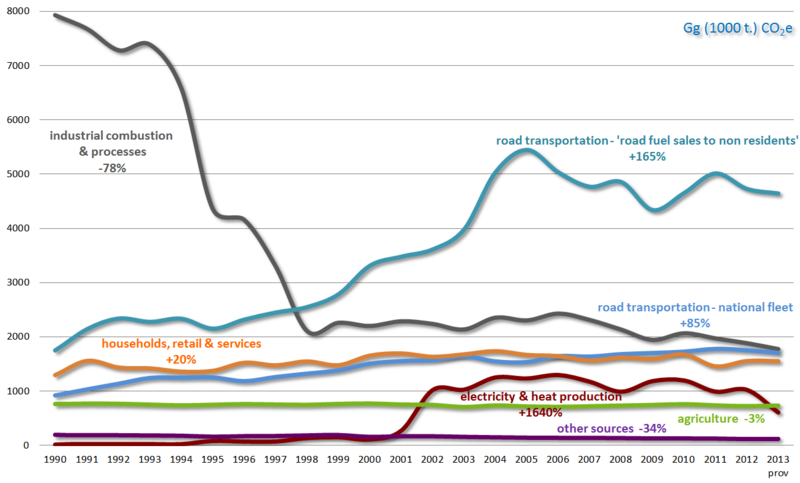 But population and cross-border commuters growth is also leading to rising energy demand, both for buildings and for transport. Concerning the latter, although Luxembourg invests predominantly and jointly with the neighbouring regions in public transport in order to alter the current modal split of home-work journeys, a vast majority of workers from abroad still commute by car (86% of these journeys in 2010). Coupling these socio-demographic pressures with the location of Luxembourg at the heart of the main Western Europe transit routes for both goods and passengers, as well as with its policy of low road fuel prices, lead to important impacts on air emissions and, to a lesser extent, to overall air quality. GHG emissions from "road fuel sales to non-residents" have considerably increased since 1990 (+165% compared to +85% for the resident population, i.e. about 42% of the total GHG emissions, excluding LULUCF - i.e. emissions accounted for in the framework of the Kyoto Protocol and related engagements - and 75% of road fuel sales in 2013). At the same time, industrial emissions have reduced a lot since 1990, both due to technological changes and to the deindustrialisation of the country. See Figure 1 and references for details. The issue of GHG emissions reduction is probably the most challenging issue Luxembourg has to face. Indeed, in the framework of the Effort Sharing Decision No 406/2009/EC (ESD), Luxembourg has the most ambitious national target of all the EU Member States for the non ETS sectors (transportation, housing, buildings, agriculture, waste): a 20% emissions cut until 2020 compared to 2005, i.e. 8.085 Mt CO2eq. The intensification of agricultural practices, urban and suburban development and an increased density of transportation infrastructure are the main driving forces affecting biodiversity in Luxembourg. While the overall status of biodiversity is still difficult to assess, national red lists, landscape statistics and monitoring of selected species often show negative trends. For instance, 74% of the species under the "Habitat" Directive are reported in the unfavourable or bad clusters, whereas this percentage is 59% for the species under the "Birds" Directive. Biodiversity-rich habitats such as wetlands, dry meadows and extensively used orchards have seriously declined over the past 30 years providing clear evidence of a rampant homogenisation of landscapes. Generally, biodiversity is in a better conservation status in forests than in open, predominantly agricultural and aquatic ecosystems. In Luxembourg, at least 70% of surface water is likely to fall short of the EU's 2015 targets for chemical and biological quality as determined under the EU Water Framework Directive (WFD). With regard to drinking water, sources have not yet been protected, despite a legal obligation to do so dating back more than 15 years. According to the application of the Ground Water Directive, 2 of 5 ground water bodies are considered to be in poor qualitative status regarding nitrates and pesticides. Moreover, rural development policies have focused more on farm modernisation and the continued use of agricultural land than on the targeted protection of water resources. The fact that cross-border commuters now represent 30% of the resident population is generating concerns in both the waste and waste water sectors: oversize investments with regard to population, high per capita ratios that do not necessarily reflect the average actual use by the resident population. The latter is often giving a biased view of the country performance when compared to other countries through benchmarking exercises. Meeting the GHG emissions targets set for Luxembourg in the framework of the ESD is undoubtedly the biggest environmental challenge the country will have to cope with in the years to come, though NOx and NH3 emissions reduction – which are somehow related to GHG ones with regard to driving forces and pressures – as well as freshwater and, to a minor extent, groundwater quality are also challenging in the coming years. For reducing substantively GHG emissions, and considering that road transportation, and more precisely "road fuel sales to non-residents", is the main contributor to GHG emissions, Luxembourg will use a policy mix of instruments with the aim of progressively reducing road transport related emissions as underlined in the second national "Action Plan for reducing CO2 emissions" adopted in May 2013. To do so, the idea is to gradually increase road fuels excise rates following a cautious approach based on a better knowledge of the factors determining road fuel sales in Luxembourg that also takes into account the impact on the public finances of the country. Definitely, a long term planning of a gradual "decoupling" of road fuel sales revenues from public current expenditure is necessary. With regard to other instruments, the Government considers the organization of transport and the necessity to overcome existing problems linked to traffic intensity as primary objectives. In this context, it intends to promote sustainable ways of transport consisting of public and non-motorized modes of transport. All this is intended to be done in a conceptual way where new modes of transport such as electro-mobility and car sharing are potentially promoted. The main tool to achieve these transport-mobility related objectives is a global strategy for sustainable mobility ("MoDu" for "mobilité durable") of residents and cross-border commuters. The planning approach developed in the framework of the "MoDu" strategy aims at reducing potential conflicts between transport planning and the environment, and seeks for synergies between a sustainable land planning and the development of transport infrastructures and offer. The 2020 target is a dual modal-split of 25% of daily trips by non-motorized traffic and 25% of motorized trips by public transport. Buildings and houses are the second domain where GHG emissions could substantially be reduced. Numerous actions of the second national "Action Plan for reducing CO2 emissions" target this sector and some of them are closely linked to measures foreseen in the National Renewable Energy Action Plan (NREAP) and the National Energy Efficiency Action Plan (NEEAP). All these measures and policies should also have co-benefits for reaching air emissions goals set for the coming years (NOx for instance) and on pollutants concentrations. Turning to water issues, Luxembourg will pay more attention to correctly transpose EU legal texts in its national legislation and deeply revise management plans as well as measures programmes so to reach the objectives set out by the WFD. Luxembourg expects to reach a 28% share of the surface water in "good ecological and chemical state" by 2015, 85% by 2021 and 99% by 2027. For groundwater, it is more complicated to estimate when a "good quantitative and chemical state" would be reached. Finally, on biodiversity issues, since most pressures seems to be the consequences of agricultural practices, it has been requested that the new Rural Development Plan better integrate environmental aspects so to reconcile agriculture and nature protection. These measures should also help Luxembourg to reach its target with regard to ammonia (NH3) emissions in the coming years. (iii) achieve a 10% share of renewable energy in all forms in total transport. With regard to "road fuel sales to non-residents", though price differences with neighbouring countries is reducing over time (notably, through increases in excises), it cannot be expected that they will be entirely offset in the coming years. Indeed, that would require aligning prices to those of the most expensive bordering country with a risk of reverse "fuel tourism" due to the size of Luxembourg. Moreover, such a policy will not lead to any substantial reduction of GHG emissions at the European level since "fuel tourism" related emissions are the smallest part of "road fuel sales to non-residents". The Climate Agreement with the municipalities was presented in October 2012 and entered into force on the 1st January 2013. It reinforces the role of municipalities in the fight against climate change through a legislative, technical and financial framework set up in order to promote action against climate change. The 'Pacte Climat' means that municipalities commit to implement a quality management system relating to their energy and climate policy as well as an energy management tool for their infrastructures and their equipment. In return they benefit from technical and financial support given by the Government. End 2014, 92 municipalities out of 106, representing 95% of the resident population, were engaged in the Agreement. The 'SuperDrecksKëscht' (SDK) is a programme for managing problematic waste from households and for implementing waste management in the business sector based on the principles of prevention, reduction and recovery of waste and promotes a new commercial model based on the 'consumption-reconsumption' philosophy. In 2010, the SDK programme has been awarded 'best practice' by the European Commission. Ministère de l'Environnement (1999), L'environnement en chiffres 1998. Ministère de l'Environnement (2003), L'environnement en chiffres 2002-2003. Ministère du Développement durable et des Infrastructures (2011), PNDD Luxembourg - Un Luxembourg durable pour une meilleure qualité de vie. European Environment Agency & FOEN (2011), EEA Report No 2/2011, Landscape fragmentation in Europe, Figure 3.1, p. 34. Frédéric SCHMITZ, Guillaume DREVON, Philippe GERBER, et al. (2012), La mobilité des frontaliers du Luxembourg : dynamiques et perspectives in Les Cahiers du CEPS/INSTEAD, Géographie et Développement. Submission 2014v1.4 to both the EC and the UNFCCC and GHG approximated 2013 inventory submitted to the EU under Regulation (EU) No 525/2013. Département de l'environnement du Ministère du Développement durable et des Infrastructures (2014), Sixth National Communication of Luxembourg under the United Nations Framework Convention on Climate Change, including Luxembourg’s Biennial Report No 1, Chapters II & III.1. Département de l'environnement du Ministère du Développement durable et des Infrastructures (2013), 2. Nationaler Aktionplan Klimaschutz. See also , Chapters IV.1.2 & IV.3.2. Département de l'Aménagement du territoire du Ministère du Développement durable et des Infrastructures (2012), Stratégie globale pour une mobilité durable – pour les résidents et les frontaliers. Ministère de l'Economie (2010), Luxemburger Aktionsplan für erneuerbare Energie. Ministère de l'Economie (2014), Dritter nationaler Energieeffizienzaktionsplan Luxemburg im Rahmen der EU-Richtlinie 2012/27/EU. For more details on this demanding challenge for Luxembourg, see , Chapter II.12. 'SuperDrecksKëscht' (SDK) programme. 'Best practice' award by the European Commission.